Bedford have started to put the finishing touches to their squad for the 2017/18 Championship campaign by signing two more backs in Jersey Reds’ Richard Lane and London Scottish’s Harry Sheppard. It will certainly be something of a homecoming for 23-year-old Lane who was born in the town and grew up playing for the junior Blues before going to Millfield School where he captained the U16s Sevens team that won the Rosslyn Park National Schools title and the All England Sevens. Lane - who can play in the centre, on the wing or at fullback - was previously a member of Northampton’s Academy before signing for Bath where he made his debut against Exeter Chiefs in the 2011/12 LV=Cup and going on to make nine first team appearances scoring a memorable hat-trick in the Amlin Cup against Mogliano. He headed to Jersey in 2015, although also spent time in Australia with Sydney University Football Club and was also dual-registered with Cornish Pirates. 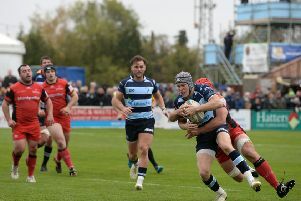 The young fly-half/centre made his first-team debut in the victory over Rotherham Titans in the penultimate match of the 2015/16 campaign and followed it up with another at Moseley. He continued to flourish at London Scottish making 14 starts this season and has previously represented England Students, as well as having a spell at Blackheath. Speaking about the signings, Blues director of rugby Mike Rayer said: “Rich and Harry are two talented young players that we’ve been keeping tabs on for a while now and I’m delighted that they have agreed to join us next season. “Rich is a local lad with strong connections to the town having played for the Juniors before being snapped up by the Saints Academy. He’s continued his development with Bath and has great pedigree from his time with Cornish Pirates and Jersey and he will add plenty of pace and finishing power to our back line. “Harry is a talented young man who has truly seized his opportunities while at London Scottish. He played really well against us last season and battled hard to make the number ten shirt his own.